When I pray for people on my prayer list, I pray and I ask the Lord for healing, comfort, and peace. But I don’t always pray with an expectation that God will actually answer my prayers. I question. I doubt. I waver. Then when He actually answers my prayers, it takes me back. I’m stunned. My faith is very small. Just this week, I have been asking the Lord to show me His realness. I want to see Him in the mundane. I want to see evidence of His work and power in my life and in the lives of others. I want to see evidence of Him in creation all around me. I don’t want to miss Him, as I so often do. Sometimes, like Callie, I just want affirmation that He is real. My friend’s daddy was going in for a major surgery last Thursday morning. He was told just weeks ago that the infection was bad and the antibiotics weren’t working. For a man in his late 70’s, the idea of a major surgery was scary. The recovery was going to be a long drawn out process. For the last few weeks, he has been getting everything ready. He would be spending the next eight weeks of his life at a nursing home recovering and in intense therapy. There was no surprise that he was very anxious and nervous. His daughter, my friend, called in many people to pray for him. The morning of the surgery, the nurses got him prepped and ready. He was about to be wheeled back into the operating room when the surgeon came in to mark the area he would be operating on. As he examined the surgery sight, he looked puzzled. The surgeon said there was no need for the surgery. He didn’t see any infection. He said he had done several of these surgeries, and there was clearly no need to perform surgery in this particular case. Whatever infection was there before, was now completely gone. Surgery was not necessary! Wow!!! Right in the midst of a mundane ordinary day, an unexpected “God moment” had occurred. Still, I was totally shocked. Why does it stun me when God answers prayer? Why am I so surprised? I forget how big my God is. I forget that He is the Creator of the universe, that He holds the entire world in His hands. I forget that He is in complete control and nothing catches Him off guard. 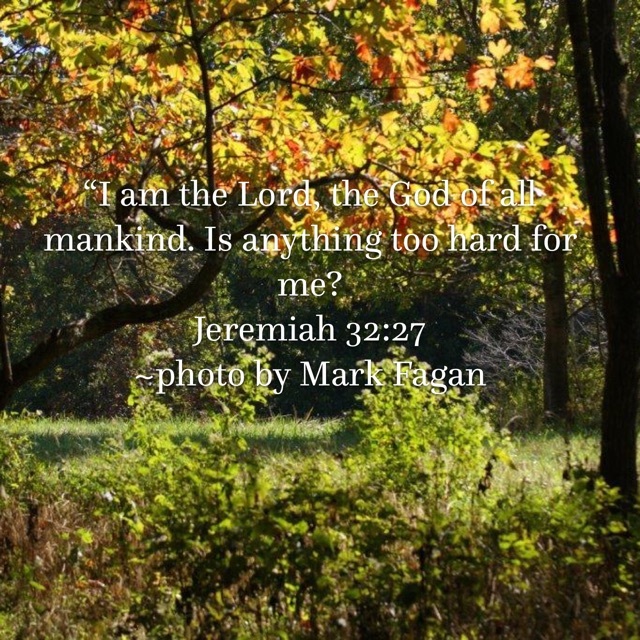 Nothing is too hard for Him. There is nothing He can’t do. Nothing. Nothing. Absolutely nothing. When we hear the so-called “facts” that the world is shouting at us, we are shell-shocked. It stops us in our tracks. We sense defeat. We feel hopelessness creep in. That is why we must continually–daily–go back to the truth of God’s Word. The truth continually sets us free. We need His truth to wash over us daily because we so quickly believe the lies all around us. We so quickly buy into the headlines that are bombarding us day in and day out. God’s Truth trumps the world’s “facts” every time. I love the story in John 11 when Lazarus got sick and died. I can see the headlines now, “Lazarus Has Died!” Those were the facts. Jesus was in another town when He received the news. It doesn’t get more final or hopeless than death. But when Jesus shows up on the scene, the dead come back to life. He walked out of that tomb with a living, breathing, healthy Lazarus. The “facts” said that Lazarus was dead, but the “Truth” brought him back to life. The older I get, the more I long for heaven. We live in such a broken world. There is so much devastation all around us. But oh if we could remember Who our God is and what He is capable of. If only we could depend on Him and trust Him with all of our hearts. And oh if we could pray with power, expectation, and boldness that nothing is too hard for our great and powerful God! When Jesus came to earth, He defeated death. He defeated brokenness. He defeated darkness. He defeated sin. We know how it all ends. We’ve read the last chapter. We win in the end because He wins. The victory is His. So next time we read the headlines and hear the so-called “facts,” may we boldly pray, claim, and cling to the “TRUTH” of God’s promises. The Truth brings life and healing power. The Truth will set us free! When facts versus Truth, Truth always wins.